As a coffee-lover, I was looking for something as comforting, warming, and delicious as coffee but without the effects of caffeine. The smell of fresh ground coffee beans makes my soul shine in the morning. Caffeine, by nature, can cause dehydration, headaches, anxiety, restlessness, and fitful sleep. By switching to herbal coffee, I could keep my nice morning and afternoon ritual without taxing my adrenal system. Dandelion Root is known to help with liver regeneration and detoxification in our bodies. It’s an herb that is highly effective in strengthening and supporting the liver. The bitter taste found in dandelion root stimulate the taste buds, setting off a chain reaction of flowing juices from saliva to bile and setting the digestive tract in motion. This helps the breakdown of fats during digestion and flushes waste away, gently detoxifying the body, making it one of the most valuable general tonics used in the world of herbalism. It is loaded with vitamins A, B, C, and D, as well as minerals, such as iron, potassium, and zinc. It also contains other powerful micronutrients, carotenoids such as lutein, fatty acids, flavonoids including apigenin and luteolin. Roasted chicory root is rich, dark, roasted and slightly bitter—the closest to coffee flavor I have found. Chicory root contains inulin, a powerful prebiotic and soluble fiber. Inulin is present in many plants, but chicory contains the highest concentration. Ghee is a gorgeous golden hue. It’s dreamy and creamy texture is health giving and energy boosting that nourishes from the inside out. Ghee is grass fed butter that has been clarified, which brings out a rich, nutty flavor. Ghee aids in the healing of inflamed joints, keeps minds sharp and your skin glowing. If those aren’t enough reasons to love ghee, this gorgeous golden substance also boasts a unique vitamin profile, including K2, which builds strong bones, and vitamins A, D and E.
Here is recipe for you to try: Dandelion + Chicory Root + Ghee. • 1 tsp collagen (plump radian skin, boots hair and nail growth and it gives it a crazy foam). • optional -sprinkle with ceylon cinnamon. 1. 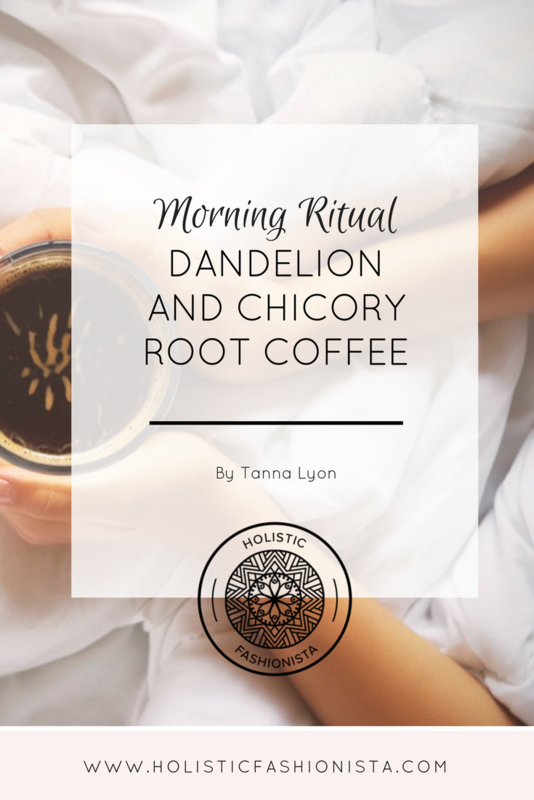 Place the dandelion and chicory root in the bottom of a french press or other container and cover with boiling water. Let steep for 4 minutes before plunging with the press or straining. 2. Pour the freshly brewed, hot herbs into a blender. Add in the remainder of ingredients. Secure the lid of the blender tightly and blend together for about 10 seconds or until the mixture is frothy. Pour and enjoy! *It is very important that the ghee is grass-fed, because ghee butter does not offer the same vitamins and nutrients. Also make sure to use quality herbs that hasn’t been treated with pesticides for maximized results.